Activists in Bologna were awoken at dawn on Tuesday (8th Aug) to news of evictions at two of the city’s social centres, Làbas and Laboratorio Crash. At Làbas, where the violence took place, this has resulted in over 30 people, including 14 migrants, being made homeless. 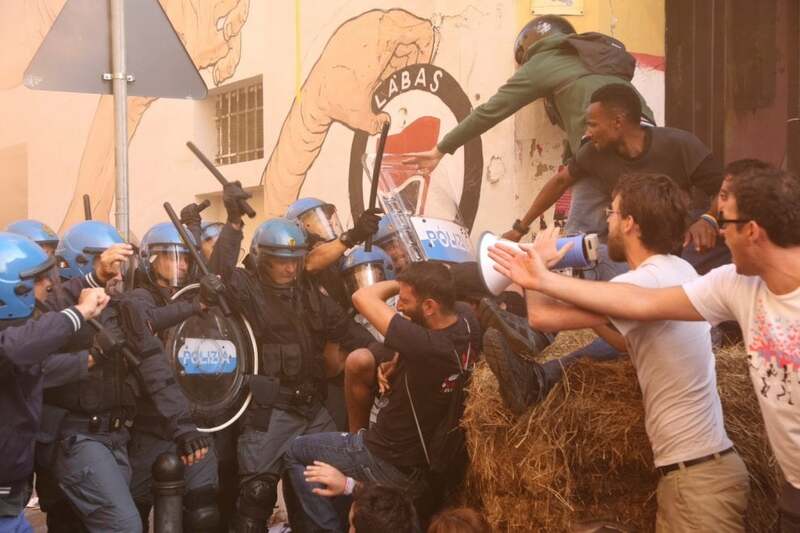 Outside Làbas, a social centre in the heart of Bologna for the past five years, around 30 activists who had been tipped off about the eviction the previous evening blockaded the entrance against riot police carrying out the eviction. Police initially attempted to drag protesters away from the entrance but, when that failed, began beating people with truncheons. Protesters fought back, creating barricades from bales of hay that had been set on fire. The entire area was shut down with police closing off streets to all traffic for hours. Fighting then spilled over into nearby streets with protesters denouncing the injuries of around a dozen people, two seriously injured by police. Police, meanwhile, claim six officers were injured during the fighting. La Repubblica reports numerous local residents coming out of their houses angered by police actions. “What problems were they causing?” one asked police. Meanwhile, activists also denounced the local Mayor, who had promised to find a solution which would avoid eviction and claims that the eviction was an independent action of the local judiciary: “Where has the mayor been these last few months? A solution hasn’t been found, we want to speak with him, for now there’s been nothing concrete. Until now we’ve seen only evictions. Activists announced that there would be a public meeting at the end of the month in preparation for a demonstration on September 9th to take back Làbas. At the same time that the Làbas eviction was happening, another eviction was being carried out at Laboratorio Crash, in operation for 17 years with roots in the post-Genova anti-globalisation movement, on the outskirts of Bologna. However, at the time police forced entry there were no activists on the premises. This eviction of the Laboratorio Crash was done through a court order for the seizure of the judiciary dated last August 4th. The first decree of emergency seizure issued nearly ten years ago was unsuccessful, we won the criminal trial with the acquittal of all the defendants [...] The owners, speculation and investment fund Prelios, had always refused to sit at a table without the assurance of some of the municipal junta, and so it came to today's eviction, ordered by the prosecutor's office, executed by the police, and made possible by the disengagement of the administrations. This is the mechanism of governance that administers the territory of Bologna by guaranteeing real estate speculation funds to enrich themselves more and more, trampling with great violence on the right to live and stealing spaces of social and cultural coming together. Bologna has long been considered one of Italy’s ‘Red Cities,’ a centre for autonomous anti-capitalist organising. In recent years, however, there has been a shift in economic and cultural model in the city whereby student/youth cultural life, itself long-associated with the city’s radicalism, has reduced in importance, replaced instead by the tourist industry and food service sector. This makes squats like Làbas prime real estate which cannot merely be handed over to the radical left to house poor and migrant workers and organise cultural activities. In 2013, Bologna saw a wave of housing occupations, which saw, amongst other things, a dozen families occupy an abandoned housing estate. However, many of these occupations have been evicted, most infamously with the shocking 2015 eviction of over 300 people (including 100 children) from the ex-Telecom building and, in 2016, the eviction of 100 people, 34 of them children, from a building in the working-class neighbourhood of Bolognina.